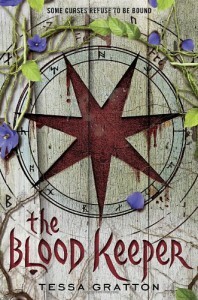 Anyone with a tendency toward hemophobia should not read Tessa Gratton’s The Blood Keeper. You will not make it through. Almost from the first page, the novel’s heroine, Mab Prowd is cutting open fingers and wrists, bleeding into bowls, and mixing it up with other ingredients to connect to the earth and work her blood magic. I often felt like I was trying to read the book between my fingers, but it’s an absorbing read, and slight squeamishness aside, I wanted to keep going.Mab Prowd is seventeen when she inherits the title of The Deacon (a magical keeper of the land, one who contains curses, and maintains a safe place for all the other blood witches scattered across the United States) from her Uncle Arthur who after hundreds of years as the Deacon has decided to move on. As a last request he asks her to destroy rose bushes planted in the garden. Unfortunately he neglects to explain the meaning behind this odd assignment, and Mab takes it upon herself to explore their power and essence before doing as he asks. She channels the energy of the roses into a creature she fashions out of mud and animal hearts. This turns out to be a big mistake – especially when her creation crosses paths with Will Sanger, a boy from the local high school who is struggling to define his own life choices at the time.I liked The Blood Keeper a lot. Gratton can run long with her descriptiveness, making for some issues with pacing, but that was outweighed in the balance by strong, well-developed characters, solid mythology and details of the dark rituals comprising blood magic, and good story-telling. Point of view alternates between Mab, Will and a former resident of the blood land which slowly proves to have bearing on unfolding events.The Blood Keeper is essentially the story of a lonely girl growing up on an isolated Kansas farm, weighted by the responsibility of inheritance and separated from people her own age. While she meets Will because of the danger she has exposed him to, they both need each other. Mab’s strength of character is sometimes to her detriment when she leaps before considering all of the possibilities, and she could benefit fun and the company of other teens. Will finds just as much comfort in her, as he tries to break away from the demands and traditions of his family in light of the unsettling death of his brother. Will was probably my favorite character in the book – his simple openness and trust, desire to do the right thing and his love for his dogs, made him very appealing and the romance very sweet. History, horror, romance and magic coincide for a compelling escapist read. Recommended.